Microsoft Teams is a chat-based workspace in Office 365 that integrates with the apps and services teams use to get work done together. Microsoft Teams has different tabs or canvases to use multiple applications in parallel. 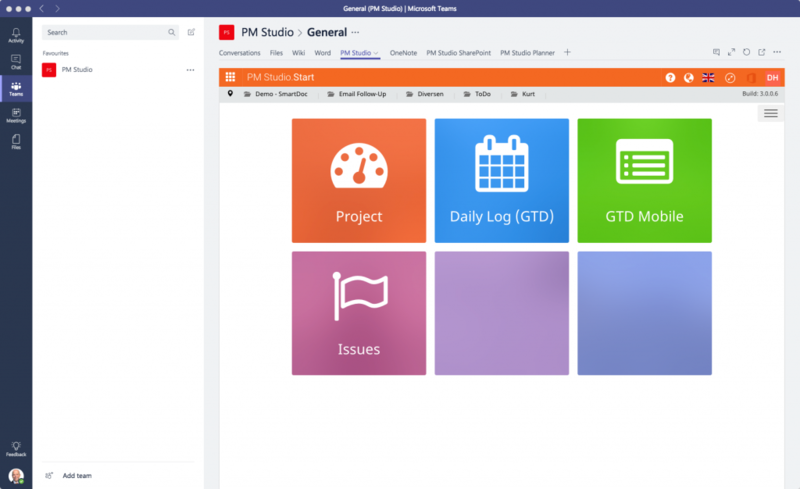 You can add our PM Studio™ Online application to one of these tabs, in order to get your projects done smoothly, and have the possibility to chat and communicate with your teammates. For customers who aren’t planning to move their advanced calling and meetings functions to the cloud, Microsoft is working on a new version of Skype for Business Server, scheduled for the second half of 2018. Microsoft also said it is planning extensive updates on Skype’s infrastructure to allow for enterprise-grade calls and video meetings. Microsoft added more than 100 new features to Teams between the announcement of the preview version last November and its official launch in March 2017, with more coming all the time. The latest center around a concept Markezich called “intelligent communications.” Microsoft will use machine learning and concepts like translation and speech recognition to automate parts of meetings to make it easier to prepare and follow up. September 2017, Microsoft said Teams is now being used by 125,000 organizations, up from 50,000 at its March launch.